Over the years on Mother’s Day I have often preached on stories of women in the Bible who played important parts in our faith history. In biblical times women were considered by the dominant culture to be of less importance than men (Thank God those days are over!). Most of the central figures in the Bible are men. But women are there – playing key roles. There are even some books of the Bible in which women are the main characters (Ruth, Esther). We may be disappointed that women aren’t featured more; the remarkable thing is how much they are mentioned and how big a part they play! Some of them are important because they were mothers of men like Moses, or Samuel. But not all women mentioned in the Bible were mothers, yet God was able to work through them in powerful ways. And yet, I don’t think I’ve ever done a Mother’s Day sermon about the most honored woman of all – Mary, the mother of Jesus. In some church traditions she is almost worshiped as if she were divine herself. We don’t adore Mary in our Protestant Christian tradition. We don’t usually have statues of her, and we don’t pray to her, but she is still a model of faith and discipleship. 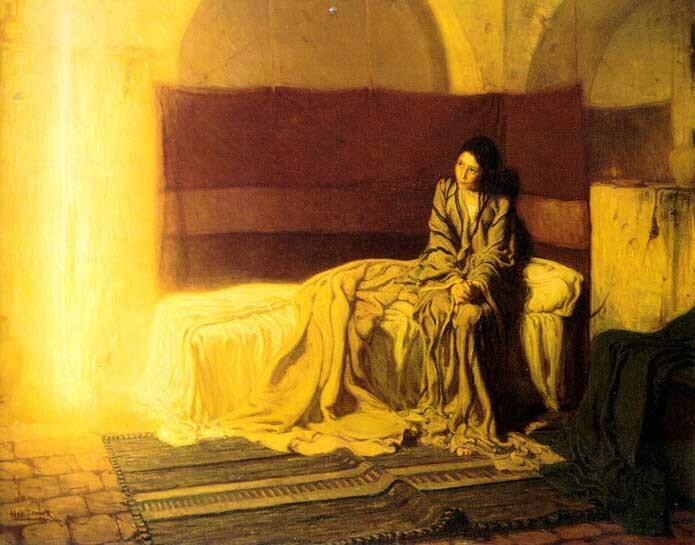 This story of “The Annunciation” – of Mary being visited by the angel Gabriel with the news that she would give birth to Jesus – is an amazing story. In the gospel of Luke, Gabriel first appears to Zechariah – with the news that he would become the father of John the Baptist. And then Gabriel appears to Mary and says, “Greetings, favored one! The Lord is with you. But Mary was much perplexed by his words and pondered what sort of greeting this might be.” (Luke 1:28-29) I can imagine! How often do angels show up and say, “Wow – do I have good news for you!” I think I’d be skeptical too. I wonder, when this young, unmarried woman found out she was expecting a child, how many people believed her story about a visit from an angel! But Mary’s response was remarkable – an act of true faith and courage: “Here am I, the servant of the Lord: Let it be with me according to your word.” She gave her consent for this unusual, life-changing, world-changing thing to happen. She gave her consent for God to use her life, and her body, for God’s purposes. And any mother knows that having children will probably bring moments of both joy and great suffering. How many of us are willing to trust God to so completely use our life? One of things this story can show us on this baptism Sunday is the wondrous things that can happen when two different worlds or aspects of life meet. Wise people have known about them for centuries, but our senses and language can’t quite grasp them. We usually call them the material and the spiritual. Or the mortal and eternal. Ancient philosophers considered them to be two different realities: The heavens (the dwelling place of the gods) and the earth (where mortal creatures live). But our spiritual ancestors thought they could come together. In one of the creation stories in the Bible, God created the first human from the dust of the earth (material), and blew into its nostrils the breath of life (or the spirit of life). That is what made a living, human being – flesh and spirit, body and soul. A living person without a soul or with a damaged soul is a pitiable thing, and capable of terrible evil. But a living spirit without a body is also inhuman, and frightening. Mary became the mother of Jesus when the Holy Spirit came upon her. In Jesus, the Christian church came to believe that the eternal, holy God had taken on mortal human flesh. Again, this was shocking to ancient Greeks – that the eternal, perfect and unchangeable Divine would inhabit messy, corruptible, and mortal human flesh. There are many people who have a hard time leaving Florida during the winter to live in Chicago; imagine leaving heaven to live on earth, not really sure if you would ever get back! We still see effects of that division between the material and the spiritual in the beliefs of many people. Some live as if the spiritual world is nonsense. To them, life is just about survival and enjoying the pleasures of the senses as much as possible until life ends. There is no meaning or higher purpose beyond that. Others see this mortal life as something to escape so they can get to the joys of eternal life in heaven. Anything that has to do with the body and with pleasure is suspect and dangerous, and probably sinful. But the life that God intended for us is both/and. Both flesh and spirit. Both material and spiritual. Our bodies are good gifts, to be enjoyed and used. But they are not the limits of our life. We are also connected with one another, with the whole of creation, and with the God who made us. We will all experience bodily death someday. But God can raise us again to new life with transformed bodies. Jesus is the model of someone who lived fully in both dimensions of life. He ate and drank with friends; he experienced pleasure and pain and death. But he also was fully aware of God’s presence and power in his life, and trusted in the spiritual reality of life. He lived to serve God. Jesus was fully human and fully divine from his birth, and even before. The rest of us humans come into this world fully aware of our humanity. We know we need air to breathe, food to eat, warmth, and human care. We experience bodily pain and pleasure. But the spiritual reality is harder to perceive. Many of us have a hard time talking about it. Maybe we once had some awareness of it, but we forget it, just as we cannot remember the process of birth or life in our mother’s wombs. We are born with only intimations of our divine, spiritual nature. But when we are baptized, that is an invitation to God to deepen our awareness of holiness and eternal, self-giving love. It is an openness to receiving the gifts of the Holy Spirit that can help others grow closer to God and one another. And it is a sign of our desire and intention to grow in our love of God and one another. When we are baptized, we are born of water (material, essential for life) and Spirit (divine, essential for fullness of life as God intended). And when we, like Mary, give our consent for the Holy Spirit of God to come upon us, and the power of the Most High to overshadow us — we may not all become mothers, but we can embody God’s power and love in this mortal world. Living fully in the material and the spiritual world, and making God’s reality known, is potentially dangerous and painful work. Many want to keep the two worlds separate. But to not live in both is to be less than what we were created to be, and will not bring fulfillment or joy. The popular music group The Police once sang, “We are spirits in the material world.” Born of Water and Spirit. That is our origin, and our calling. This entry was posted in Sermons on May 12, 2015 by lyonsvillechurch.